Cities and counties come to grips with the high cost of recycling programs. Local governments have mailed out brochures. They’ve held live web chats. They’ve designed helpful magnets. But D.C. metropolitan area residents — like recyclers across the country — are still tossing a whole lot of stuff into their recycling bins that shouldn’t be there. And it costs so much to sort that some cities and counties are losing money to recycle. Now, some local officials are starting to acknowledge that it’s time to be smarter about recycling. That starts with being clearer with consumers about what should and shouldn’t go into the big blue bin. Not as easy — and not as lucrative. Once a profitable business for cities and private employers, recycling in recent years has become a money-sucking enterprise. The District, Baltimore and many counties in between are contributing millions annually to prop up one of the nation’s busiest facilities in Elkridge, Md. — but it is still losing money. Almost every facility like it in the country is running in the red. Waste Management and other recyclers say that more than 2,000 municipalities are paying to dispose of their recyclables instead of the other way around. One of the main culprits is a fluctuating global market for plastic and aluminum that local authorities can do little to control. But another is the cost of sorting a multitude of materials that often arrive in a single truck, is highly contaminated driving down the value of the recyclable good because there is too much other stuff mashed up with it. The realization that more isn’t always best has prompted some debate about whether the big blue bins and “single stream” systems employed throughout the country are really all they’re cracked up to be. One bin for all materials makes it easier for people to recycle, but it can also make the process more costly. Several years ago, in the interest of encouraging more recycling, the District followed a pattern set by other cities across the United States and switched from dual stream to single stream. Now it appears less certain that the big blue bin is the easiest option or the way to go. When recycling bins were filling up because residents were tossing so much in them, the city simply doubled their size. Fines for placing recyclables in the trash also prompted private companies to err on the side of recycling. The District’s Department of Public Works says it has worked to educate residents on what is acceptable and what isn’t acceptable for the city’s recycling bins. The Public Works Web site lists glass, plastic lawn furniture and dozens of other objects, big and small, as items that should go in the recycling bin. The only things the District officially says cannot go in the recycling bin are plastic foam and pizza boxes. Recycling over the past year has cost the District more than a million dollars, after making a profit in 2011, in large part because the quality of recycled product has gone down because of contamination. “If the blue bin becomes nothing but a trash bin, then we’re missing the point and missing an opportunity,” said D.C. Council member Charles Allen (D-Ward 6), who sits on the council’s Committee on Transportation and the Environment. “If our current recycling system isn’t working as well as it should, then we need to explore what changes we’re comfortable asking residents to make, and what changes in collections we can reasonably expect the agency to take on,” he said. In some of the District’s neighboring counties, officials are feeling similar pressures. Fairfax County, which netted an average $16 per ton of recyclables in 2011, and paid an average $38 per ton this year, is now weighing the real benefit of a single-stream system. The cities of Alexandria and Arlington have also started sending out e-mails and brochures about smarter recycling practices. And in Prince George’s County, where contamination has also sent prices climbing the county has decided that it will no longer accept plastic bags/film of any color, size or shape in its Recycling Program, starting on July 1. Glass, too, has come under scrutiny. Every county and city recycling program in the region accepts it. And no sound evokes the arrival of the recycling truck quite like the crunching of shattering glass. Yet, officials now agree that it has little value to recyclers. When it breaks, they say, it just tends to end up in landfills. As technology changes, cities have to look down the road and continue to evolve their policies to determine if it is still worth recycling glass. Glass is very heavy and really contaminates the other recycling material. One bright spot on the map, might be Montgomery County, which still maintains a “dual-stream” system, and which, still churns out a profit. The two-stream system makes for less contamination — better sales and less material diverted to landfills, and really isn’t much harder for residents than dealing with a single bin. Though there are pitfalls in the economics of recycling, there is still value in diverting recyclables from landfills. Most advocates agree that governments do not institute recycling programs to save money, but instead to save energy and maintain the environment. People have been preaching the importance of the three R’s (Reduce, Re-use, Recycle) for years now – and with good reason. There is truth in saying that recycling reduces pollution and the need for large CO2 producing-landfills, saves limited natural resources such as water, mineral, oil, and coal, and preserves energy by decreasing production numbers. If we eliminated recycling programs completely 30 percent of solid waste that we recycle would be completely lost. That means that instead of re-using old materials, we have to produce more virgin products from natural resources, a practice that is neither energy- nor cost-effective. For example, recycling an aluminum can saves 95% of the energy required to otherwise produce it from raw materials. According to the EPA, every 10,000 tons of solid waste hauled into a landfill creates 1 job. Every 10,000 tons of recycled material, however, can result in 10 recycling jobs or 75 material reuse jobs. If the United States could amp up its recycling rate to 75%, it would create nearly 2.3 million jobs across the nation. Therefore, while recycling may not be the most cost-effective program for cities, it helps provide stable, green jobs for the millions of unemployed persons in the U.S. Thus, cost is not the only factor in cities’ decisions to institute recycling programs. The question will always stand: for whose best interest do we recycle? This entry was posted in Recycling, Technology and the Environment and tagged Big Blue Bins, BioHitech America, Contamination, Recycling Programs on July 28, 2015 by Lisa Giovannielli. As reported first by CBS New York, New Yorkers complain that being asked to compost their garbage is creating a stinky mess. 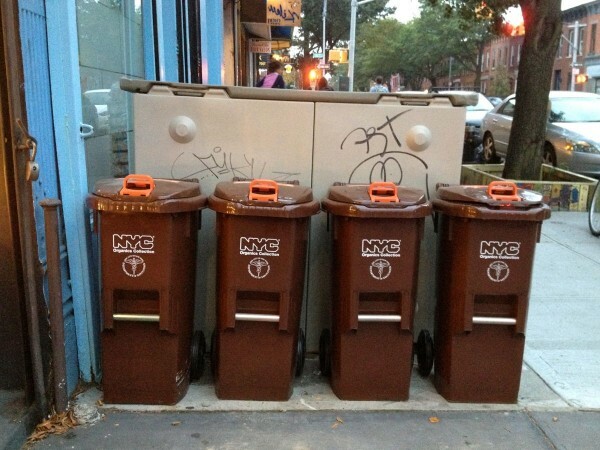 NYC residents have green bins for regular garbage, blue ones for recycling and now brown ones for composting and residents of Greenpoint located in the borough of Brooklyn are none to pleased with the new bin. Marzena Golonka, a Greenpoint building owner says her neighborhood stinks and it’s the city’s fault. The city is also always complaining about the rodent problem, and now in Greenpoint along with many other neighborhoods, the addition of the brown bin is like putting out a welcome mat for the rodents. Walking down Guernsey Street, CBS news reports that you can barely breathe through your nose due to the stench. Neighbors say the brown bins for composting are not working – the reporter found one that was not securely closed and had maggots spilling out of it. For years, residents voluntarily dropped off food waste at compost sites throughout the city, but with some restrictions. Meat, fish, and dairy products were not allowed; they took too long to break down and are way too smelly. But for some reason, the curbside pickup by NYC sanitation will accept the odorous items. The true test will be when businesses are tasked with separating out their food waste from the regular trash. Hearings begin in the fall of 2015 to map out the city’s plan for commercial businesses. Until then Kathryn Garcia, the city’s sanitation commissioner admits that they are still experimenting in certain parts of the city and still is unsure what is going to be best for the city of New York. 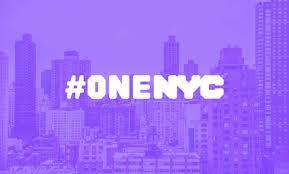 This entry was posted in Environmental Concerns and tagged BioHitech America, Commercial Food Waste Ban, Composting in NYC on July 20, 2015 by Lisa Giovannielli. In the waste industry, a key criticism is the lack of data or, where data does exist, a lack of accurate information. For example, almost all operations have no idea how much waste they have, what kind of waste it is, how to prevent the waste, and where the waste goes. In recent years the conversation regarding the need and importance of data has evolved tremendously. About five years ago responses were mixed, with some expressing how important data was, while others indicated they had a hard time seeing how the additional information might benefit their operations. In contrast, today it is rare to come across someone who isn’t interested in or doesn’t see the value that good data can bring to their operation. The data, however, continues to be hard to get a hold of but if you are one of the lucky ones, the data you are receiving can vary from asset management to tracking utilization to understanding how many pounds are being managed to determining waste composition. The list goes on. The point is that there is a strong push to acquire data and exploit the knowledge gained to evaluate everything from internal efficiencies to potential competition. There was always some interest in this before, but what seems to have qualitatively changed is that there is now the ability to easily acquire accurate data from none other than the Eco-Safe Digester. This on-site technology that was originally manufactured to eliminate food waste has been collecting waste data via the cloud for more than two years. Eco-Safe Digester customers are receiving data in ways they’ve never seen before. The level of data continues to grow from once only seeing the pounds diverted and dollars saved from the traditional and compost costs to now understanding what’s happening internally in each department, by each employee and from one location to the other. The information acquired now allows a company to understand its place in the world, evaluate trends, and save more money. As data acquisition and availability increases, operations will be able to incorporate this corporate-specific data in their operations, forecasting and business development activities. Additionally, Ec0-Safe Digester customers as well as the public and potential investors are looking to this data to gauge what is happening with the waste that is generated and how users adjust their behavior to prevent it altogether. Because the data is accurately measured on-site and streamed simultaneously to a secure platform its credibility is not an issue. BioHitech America represents that the data is not skewed or flawed in any way as decisions are made based on this information. The importance of accurate data is critical as it can spell the success or failure of any sustainability project, something BioHitech America takes very seriously. Portions of this story was previously published on May 4, 2015 in Waste 360 and written by Bryan Staley. Bryan Staley, P.E., is president of the Environmental Research and Education Foundation, a non-profit research organization that represents the entire industry and has been working to aggregate credible and reliable industry-wide data. This entry was posted in Technology and tagged BioHitech America, Eco-Safe Digester, Waste Data on July 2, 2015 by Lisa Giovannielli.